I didn't imagine that the cotton covering would be so soft and lovely! I wanted a microfiber cover but didn't find that until later in my shopping. This comforter has generous, plush, down filling and is the perfect weight for Southern California winter nights. It might be skimpy for colder climates. The color is gorgeous even though it doesn't go with anything else in the room. I whole heartedly recommend this comforter. With lovely, sophisticated color that lends a refreshing touch of style to your bedroom, this microfiber down comforter is a special find. The touchable microfiber houses fluffy, luxurious down that wraps you in luscious softness all year round, giving you the coziest of nights for years to come. Down and feather-filled products are packaged tightly during shipping. Upon receipt, remove this item from its packaging, fluff gently, and allow several hours for full loft recovery. In addition, products sealed in plastic packaging sometimes have a disagreeable scent because of concentrated natural fibers. A few hours of airing typically removes the odor. We recommend that this item is fluffed at least once a week to maintain down distribution. I ordered the coral colored down comforter expecting a bright coral color. When I received the comforter I found the color was a little different than what I expected. The color is more of an orange hue then it is a pink hue. 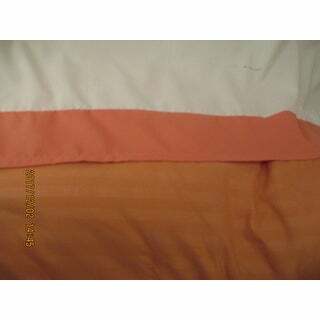 Below is the comforter next to my coral dust ruffle. We all know that the computer screen can show color a little different than what it is in person and that is not the retailer's fault. Comforter is good thread count and the stripes give it a classy look. We have a CA. King mattress and my husband is a ratter when he sleeps. This allows me to keep my own blankets on me, he uses it all year round. You really can use this comforter for year round comfort, even in our summer months. Super lightweight and very comfortable. No clumping when laundered either. Would love one for my own. I absolutely love the color and feel of this comforter. It's not very heavy, but I prefer that. I'm hoping that it lasts a while without flattening out. It was definitely worth the price! The touch is soft, the down is lofty and just perfect for the warmer seasons and it washes and dries beautifully. I got the lilac microfiber down comforter. I love it! The color is beautiful! It's warm and toasty! If you're always cold at night, this is the gift for you! You'll never need anything else! I bought one from Overstock about 15 years ago. It finally wore out and I couldn't clean it. I got white. The new colors are beautiful and there's one for every taste! You won't beat the price either. I promise you that. Best thing I bought all year! I will be buying one for my granddaughter. She loves it. Color is perfect, exactly as it looked on the website. Thickness is where I was disappointed. If its cold then another comforter or blanket would really be needed. "The description indicates "550 fill power down"? Does this mean the ingredients include goose or fowl feathers." Allergies I have asthma hopefully this will work for me. I prefer a microfiber comforter to cotton. It's more stain resistant and softer than cotton. And who could resist that luscious coral color! Down-filled comforters provide more than just warmth and coziness during the cold winter season. These bed comforters complement your bedroom decor while helping to create an inviting ambiance that can guarantee a good night's rest. Cleaning a down comforter is not like doing regular laundry. There are special steps for washing your comforter that will allow you to clean it properly and greatly extend the life of the down bedding. Follow these steps to keep your comforter clean and comfortable for years to come. When you're decorating a bedroom, bedding is one of the most important choices. Duvets and down comforters look similar, but have different benefits. Before you choose, make sure your selection suits your climate, budget, decor style, and laundry preferences. 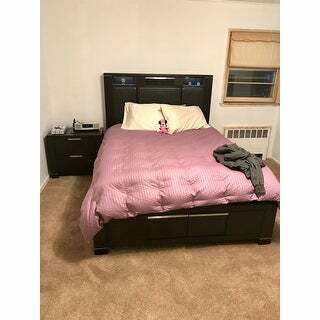 With the right bed covering, you can sleep comfortably and enjoy easy maintenance. Bedding sets filled with real or alternative down are snugly and soft, and they keep you warm when there's a chill in the air. It's hard not to love your down comforter, but no matter what size comforter you place on your bed, at some point, it accumulates too much grime and requires a good washing. Before you attempt to clean it, read these helpful tips for properly cleaning your cozy bed cover. How to Pick the Perfect Down Comforter from Overstock.com. Our guides provide customers with information about how to pick the perfect down comforter.